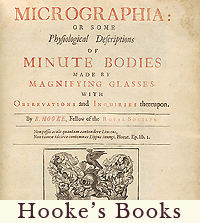 Robert Hooke (1635-1703) was a remarkably versatile man — artist, biologist, physicist, engineer, architect, inventor, and more. 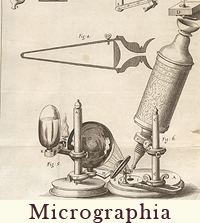 However, his crowning glory was Micrographia: or Some Physiological Descriptions of Minute Bodies made by Magnifying Glasses, first published 1665. It was a masterpiece — an exquisitely illustrated introduction to the previously unknown microscopic world. 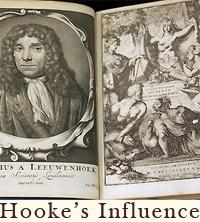 This exhibit focuses on Hooke's influences and legacy in print, the pioneering books that stimulated Hooke's research, and the works he left for others — most famously the great Dutch microscopist, Antoni van Leeuwenhœk (1632-1723). August 1 – November 1, 2007.